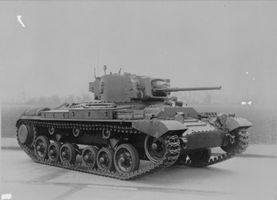 Designed in 1938 by Vickers-Armstrong, the tank was one of the best in its class. A total of 8,275 vehicles in various modifications were manufactured from 1940 through 1944. 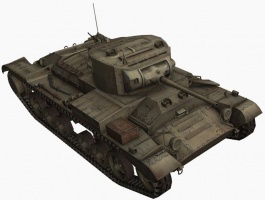 With its slow speed, relatively high armor values, and good selection of guns, a "Pocket Heavy Tank" might be the best way to describe the Valentine. Its play style is not unlike the AMX 40 or Matilda though a bit faster and slightly more maneuverable at the cost of slightly worse armor. It is a light tank in name only, and should be played like a heavy, taking damage for your allies with your heavy armor. - Very durable: has decent hit points pool and reasonable armor. - Good selection of well rounded guns with high penetration (6 pdr) or high alpha damage (75 mm), both which are accurate. - Surprisingly excellent camouflage value while stationary, but does not receive the light tank full-camo-on-moving bonus. - Very little sloping; easy to hit a flat surface. 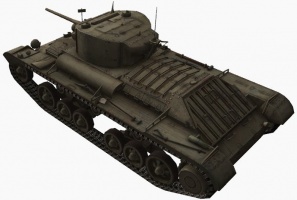 Your small silhouette, powerful guns and thick armor makes this vehicle a pocket-sized heavy tank, able to hold down areas and deny the opponent access to contested area. The small size and consequently good camouflage values allow it to hide very easily, and can be positioned at lanes where scouts tend to rush down. The tank can hide behind virtually anything, and can even drive under some buildings. The superior firepower and armor combined with on-par maneuverability would mean certain death to lone scouts. 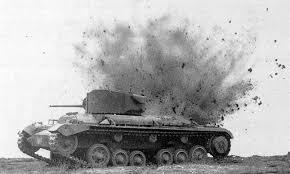 Against heavier vehicles, its can hit well above its weight in a slugging match, presenting a small, hardened target. It plays much like the AMX 40 and the Matilda. 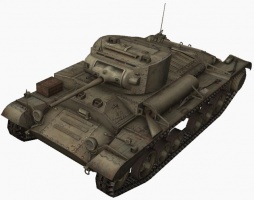 Where the Matilda has the best firepower and the AMX 40 has the best armor due to its sloping, the Valentine is much more flexible, given two powerful and useful gun options and can easily reach its top speed of 24 kph on level ground, where the AMX 40 struggles to reach 20 kph and the Matilda needs to go downhill to reach 24 kph. It is also much more maneuverable and smaller than either the Matilda or the AMX 40. The Valentine has a very short profile, giving it the option of going for stealth, if desired. Given its slow speed and the relatively slow firing rate of its guns (apart from the stock gun), passive spotting and sniping are typically the best options when placed in the bottom tier of matches. Naturally this works better with the Camouflage skill, but it's up to the player whether it's worth the trade-off over other skills. 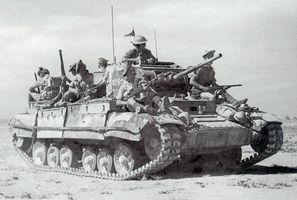 Like the Matilda, it can defend positions with its armor, which when angled can bounce all but the most powerful shots. You can research the engines first, but if you do, go all the way to the GMC 6004 6-71A. The two in between give reduced chance of fire, but at the cost of reduced horsepower. The actual crew layout of the Valentine is a commander, gunner and driver. The commander acted as the loader. 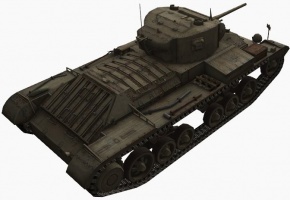 The Valentine Mk XI variant had four crew members, of whom the gunner is currently missing from the in-game vehicle. One of the Valentine's historical armaments, the OQF 3-inch howitzer, is also missing. This page has been accessed 130,991 times.